The healthcare industry has come a long way since the days of handwritten patient charts kept in file cabinets, waiting weeks to get test results back, and enormous wait times to see doctors. With the technological boom of the past several decades, not only are records digitalized, but they are also mobile, leading to numerous benefits for medical professionals and patients. Going to the hospital or a doctor’s appointment is not the highlight of anyone’s day. With medical computer carts on wheels, patients have quicker appointments, prompter test results, and more face-to-face time with doctors. It is simple for a clinician to review patient information for accuracy, and to check notes from previous appointments. Patients can even get discharge information and schedule future appointments without having to go to another area of the office. Mobile technology has created a more streamlined visit for patients, from start to finish. For medical professionals, there is often a need to do research on symptoms and to look back into a patient’s history, which can be done front and center with the use of medical computer carts on wheels. Clinicians no longer need to write out prescriptions, discharge orders, or orders for future diagnostic procedures because they can do it in the office, and even send the orders electronically, so the patient does not have to wait for prescriptions or keep track of paper orders. Healthcare professionals can also take the cart from room-to-room to visit patients, without having to take the time to get each patient’s chart in between; this is especially helpful for emergency room providers. Many medical computer carts on wheels have options for various pieces of equipment to be attached, allowing for diagnostics to be completed right there in the room. 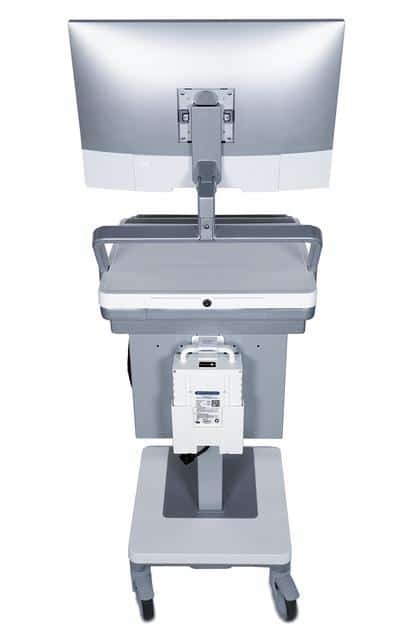 A mobile cart may have an ultrasound machine, tools for checking vitals, equipment for taking blood, and other common in-office procedural tools. 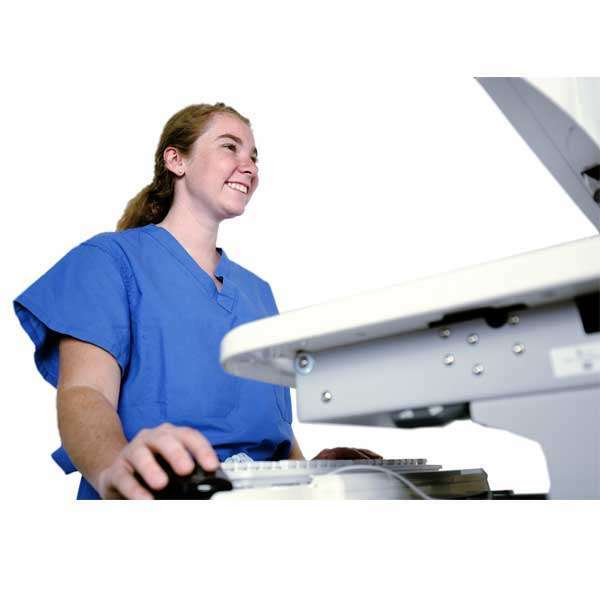 With many carts being completely customizable, a medical provider can choose what peripheral features they want their cart to have based on their needs. With the emergence of mobile computing, patients no longer must worry about their personal information being out for anyone to see, as was the case in the days of walls and cabinets visibly full of patient files. Information is kept secure in the provider’s network and only shared with other providers with permission of the patient. Providers have different means of protecting their networks, and mobile computer carts on wheels can be customized with devices such as fingerprint or card scanners to give access to the patient network. There is no need to have patient files floating around anymore when the network can be accessed from a variety of terminals throughout the office or hospital, and even transported from room-to-room for ease of use. Now that the days of handwriting orders and prescriptions are in the past, there are fewer errors from conception to fulfillment – doctor to pharmacist. Now, these digital records are mobile there are even fewer errors because prescriptions can be sent to the pharmacy while sitting right in the room with the patient, rather than walking from the patient’s room to the computer terminal and encountering other distractions along the way.